Hook: Dimensions depend on local fish. As a rule, the bigger the fish, the bigger the hook. Wide gap. Weed guard: Nylon, not thinner than 0.35mm fixed on the hook shank and bent to the hook eye, where it is fixed and glued. Tail: Colored long and soft feathers. Not less than 2 on each side. 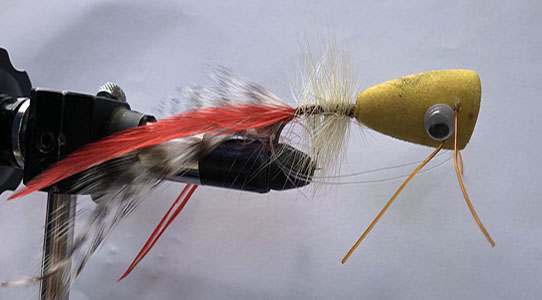 Pass the tying thread several times between the feather to ensure they stay well separated. Legs: Two or three elastic rubber pieces going from side to side of the body (make a small hole with a big needle and pull the rubber through the body). Fishing Tips: There are few rules for popper fishing: cast near anything that floats (reeds, leaves…) or a visible hunting fish, let it rest for a while and retrieve with stop-and-go strips. Don’t worry if your cast is noisy. Black bass are attracted by preys fallen into the water or struggling to reach the shore. Best in not too deep water, near the bank or the reeds.